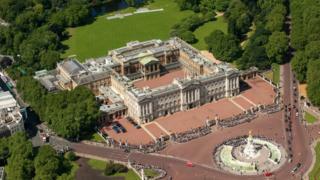 Buckingham Palace is to undergo a 10-year refurbishment costing the taxpayer £369m, the Treasury has announced. The Queen will remain in residence during the work, to begin next April. Tony Johnstone-Burt, Master of the Queen's Household, said phased works offered the "best value for money" while keeping the palace running. The Royal Trustees, who include the prime minister and chancellor, recommended that the works be funded by a temporary increase in the Sovereign Grant. Profits from the independent property business Crown Estates go to the Treasury, which in turn gives 15% of the sum to the monarch in the form of the Sovereign Grant, which this year totalled nearly £43m. The trustees say the grant should rise to 25% of the profits for the repairs. This would require MPs' approval. Away from the splendour of the state rooms, Buckingham Palace shows its age. It is striking while walking through the back corridors that the overall look is a little shabby. The refurbishment is clearly long overdue and it appears the building is now at risk from electrics, plumbing and heating barely updated since the 1950s. Questions will be asked over why the palace has been allowed to get to such a state and whether the enormous estimated costs could have been reduced if services had been regularly updated. At a briefing on Friday, palace officials were clearly conscious that in times of austerity such expenditure needs to be justified, and they were at pains to do so. When asked how they thought the public would react, one said they did not know but hoped "it will appeal to their sense of nationhood". Mr Johnstone-Burt said that by making the investment now, "we can avert a much more costly and potentially catastrophic building failure in the years to come". The Treasury said an "urgent overhaul" of the palace was needed to prevent the risk of fire, flood and damage to both the building and the priceless Royal Collection of art belonging to the nation. Pointing to the damage Windsor Castle had suffered from a fire in 1992, the Treasury said: "The restoration took more than five years, and it is estimated that similar damage to Buckingham Palace could cost up to £250m for a single wing." According to the Royal Household, the palace's boilers are more than 33 years old and spare parts for them are difficult to source. Much of the wiring is considered to have the "very real risk of fire and failure", while the majority of the mechanical and electrical systems are at least 40 years old with failure an "ever increasing risk", it said. Campaign group Republic, which wants the abolition of the monarchy, said the refurbishment was "an indictment on the Queen's scandalous mismanagement of royal finances over six decades". It added: "MPs have repeatedly called on the palace to fund repairs by opening up to tourists all year round and they've refused". As Her Majesty's administrative headquarters, the Queen spends a third of the year hosting events at Buckingham Palace. When in town, she holds weekly audiences with the prime minister, and every year welcomes more than 50,000 people as guests to state banquets, dinners, receptions and garden parties. It has served as the official London residence of Britain's sovereigns since 1837, playing host to a stream of historical figures, including author Charles Dickens, the US Presidents Woodrow Wilson and John F Kennedy, Mahatma Gandhi - who wore a loin cloth and sandals to tea with King George V - Neil Armstrong and Nelson Mandela. The occupied royal palaces are held in trust for the nation by the Queen but the cost of maintaining them falls on the government. The works will be carried out on a phased basis, completing one wing at a time, awarding contracts separately for each phase, aiming to minimise the financial and practical risks, the Royal Household said. In 2014, MPs criticised the Royal Household for mismanaging its finances. A report by the Public Accounts Committee said the Royal Household was "not looking after nationally important heritage properties adequately", saying that in March 2012, 39% of the royal estate was "below what the household deemed to be an acceptable condition". The Chief Secretary to the Treasury, David Gauke, said: "We will ensure every penny spent achieves the greatest value for money". He said it was only right to ensure Buckingham Palace was made "fit for purpose" for the future. "Tourists are drawn to this country because of our culture, heritage and royal legacy, and when they visit they spend billions of pounds and support thousands of jobs," he said. "We must ensure that the special architectural and historic nature of some of our greatest buildings are protected for future generations." Mr Johnstone-Burt said the programme, once completed, was designed to extend the palace's working life by a further 50 years.